Foreclosures continue to decimate communities around the nation, with black neighborhoods being the hardest hit. Some pundits and politicians point to federal policies that encouraged homeownership in low- and moderate-income communities, coupled with reckless behavior on the part of greedy homeowners, as the crux of the problem. One example is the statement by Fox News reporter Neil Cavuto that "loaning to minorities and risky borrowers is a disaster." To the contrary, our recent research demonstrates that it is outside investors living in other, predominantly white neighborhoods, not local homeowners, who account for the adverse impact on our nation's black communities. Observers ranging from Credit Suisse to the Center for Responsible Lending estimate that about 6 million families have lost their homes to foreclosure and project that 12-15 million families altogether will lose their homes before the crisis is over. According to the U.S. Department of the Treasury $17 trillion in household wealth was eliminated between 2007 and 2009 and more losses are sure to come. Such losses reduce property taxes, cut consumer buying power for local businesses, and weaken the ability of municipalities to provide vital services. In the end, all households, businesses, and non-profits suffer if they or their neighbors are foreclosed and lose their homes. 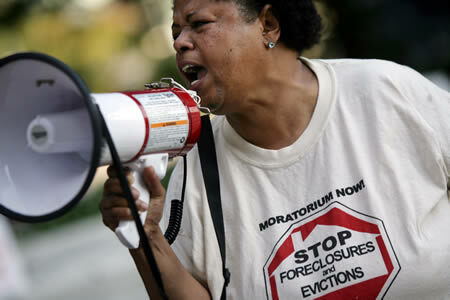 Recent foreclosure activity and the subsequent costs are not race neutral. According to the Center for Responsible Lending approximately 8 percent of African-American and Latino families have lost their homes to foreclosure compared to 4.5 percent of white families. 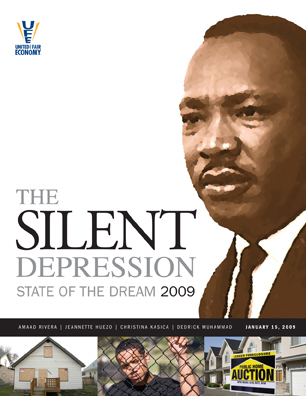 United for a Fair Economy has estimated that a third of black households and 40 percent of Latinos are at risk of falling out of the middle class and into poverty as a result of the foreclosure and related economic crises. So what accounts for the concentration of subprime lending and foreclosures in minority neighborhoods? The culprit, at least in Louisville, is investors, primarily white investors who do not reside in the affected communities. In our research we found that in 2007 and 2008 there were approximately 2,000 foreclosure sales each year in Louisville. There were 39 per census tract (a rough approximation of a neighborhood) in black communities compared to 20 in white tracts. More telling is the fact that there were 15 foreclosures on properties owned by investors rather than owner-occupants in black communities compared to two foreclosures in white areas. A close examination of foreclosed properties in black neighborhoods found most owners were white and often living miles away in suburbs. It is investors seeking a quick profit, not homeowners, who are the real problem in black neighborhoods. We suspect Louisville's story is not unique. Louisville is right in the middle of this pack, ranking 103 out of 203 metropolitan regions in the rate of foreclosures in recent years. Several factors account for why a property goes into foreclosure and why foreclosure rates are higher in some neighborhoods than others. Race is certainly not the only factor, and may not even be a consideration when other variables are taken into consideration. We controlled on a range of variables that contribute to foreclosures -- crime rates, housing values, household income, employment levels, vacancies, number of high-cost loans -- and found that the rate of foreclosures for owner-occupants was no different in black and white Louisville neighborhoods. That is, race was not a factor in accounting for differences in the rate of owner-occupied foreclosures among Louisville neighborhoods. Read this column by John Gilderbloom and Gregory Squires in its entirety on HuffingtonPost.com.